Kanata Academy is a private school currently located in the Kanata Lakes / Beaverbrook neighbourhood of west Ottawa. However, Originally established in 1996, the school offers preschool through Grade 12. Features include small class sizes and daily communication between teachers and parents, all offered at one of the lowest tuition rates in the city of Ottawa. After taking over the school in 2011, Dr. Kevin and Shannon Rattray realized quickly that the Beaverbrook Mall, although a great facility for the first 16 years of Kanata Academy, was not the ideal long-term location for the school. Many parents expressed the desire to have the school in a stand-alone facility and have traditional features of a private school such as a gymnasium, soccer field and distinct classrooms. In 2014, negotiations began to purchase a 2-acre property at 180 Huntmar Drive, on the border between Stittsville and Kanata, just a few hundred yards south of the Canadian Tire Centre. ​It is with excitement that the staff and students of Kanata Academy wait for the construction of the new building to complete. School will begin in September in the current location, and as soon as construction is complete, the staff and students will move into the new building. Kanata Academy has been a private K - 8 school for the past 20+ years, but starting in September of 2016, the Rattray’s are excited to announce the addition of Grades 9 through 12. Kanata Academy will offer a strong academic and unique high school experience that is in line with 21st century learning, Ontario Ministry Curriculum expectations and the Growing Success Evaluation and Assessment Guide. A full time, blended learning day program will be offered for high school students, and credit courses will also be offered completely online. This exciting new endeavour will offer students opportunities to earn their high school diploma through strong curriculum, differentiated instruction, and engaging content all while learning essential skills needed for the changing face of post secondary schools and the work force. Known for its strong academics, Kanata Academy meets and exceeds the standard Ontario curriculum, allowing your child's education to thrive through individualized learning programs, taught by fully-certified teachers. The mission of Kanata Academy High School is to develop critical thinkers, to foster a resilience in students that is essential for great accomplishment, and to motivate students to be discerning believers in the importance of lifelong learning. Our teachers and support staff are dedicated to making our students feel safe, important and valued. We teach our students to be curious, confident, resilient and independent learners by providing a stimulating atmosphere that supports risk-taking and encourages students to express their ideas. Our school follows the curriculum set out by the Ontario Ministry of Education and to adhere to the principles and policies outlined in "Growing Success: Assessment and Evaluation, and Reporting in Ontario Schools" in order to improve student learning. Due to the nature of our online courses, we are also able to enhance the curriculum to engage students, promote interaction and differentiate activities to meet the needs of all learners. One way in which we encourage leadership is through participation in Duke of Edinburgh Award program, Cooperative Opportunities in the community, Community Volunteer work and being encouraged to model and share knowledge and ideas through class discussion. We do not tolerate bullying in our school. Students are expected follow an online code of conduct. Teachers encourage their students to seek to understand the actions and feelings of others without passing judgment. We provide a structured, safe and respectful environment wherein students are expected to show compassion, empathy and acceptance. Kanata Academy fosters communications between the student and teacher upon enrollment in order to begin the dialogue concerning teacher expectations in the course. Parents are kept up-to-date through regular communication in the form of newsletters, online blog, Twitter posts, Facebook page and access to teacher’s contact information. Teachers make themselves available to answer any questions from students or parents. Parents and students are very appreciative of the emphasis our teachers place on ensuring good communication between home and school. All school administrative staff will have their contact information viewable from our main website. Kanata Academy will enable all staff to receive student feedback in order to create the best course to meet the needs of their students. KA will encourage an environment where student and parent voicing of concerns is encouraged and welcomed and that any concerns are addressed promptly and effectively. Kanata Academy provides a student-centered education in an online environment. KA offers students continuous intake course option, a work at their own pace model for completely online students and a monitored and structured model for the blended learning day students. to contact the student upon registration in order to provide the necessary information to the student so he or she can begin the online course right away. Kanata Academy will establish and maintain OUAC or OCAS accounts for our OSR students planning to entering post-secondary institutions upon graduation from high school. KA will produce and forward copies of the Ontario Student transcripts to post-secondary institutions in a timely manner. KA will make arrangements for students to write the Ontario Secondary School Literacy Test (OSSLT) and offer services to help all students prepare for the test and receive accommodations if applicable. To establish a Kanata Academy Individual Education Plan (IEP) for exceptional students in order to identify the student's specific learning expectations and how these expectations are to be accommodated within their online course. It is Kanata Academy’s responsibility to establish and maintain Ontario Student Records (OSR) for those students who are the sole responsibility of Kanata Academy, following the Ontario Ministry of Education's guidelines. Finally, it is the responsibility of Kanata Academy to determine the equivalent credits earned by students entering the Ontario school system in their previous educational setting and to advise the student on the remaining requirements to be completed in order to earn the Ontario Secondary School Diploma (OSSD). Some courses may require additional hardware such as a camera, microphone or speakers. Please refer to the specific course outline to determine if any additional software or hardware is required or provided in the course. Every student in Ontario is required to remain in secondary school until they reach the age of eighteen or obtain an Ontario Secondary School Diploma (OSSD). Kanata Academy is not a traditional high school and we believe we offer a high quality education that embraces the changing face of education and provides students with opportunities to meet their goals while learning the skills they need to be successful in the changing face of post secondary education and the work force. Kanata Academy’s Administrative staff promise to create and maintain meaningful and productive interactions between students to ensure that technology and learning online does not in anyway deter the learning process. The Principal and teachers promise to provide meaningful and quality course content to meet the Ministry Curriculum expectations and to properly prepare students for postsecondary opportunities and the workforce.The Principal and teachers also promise to allow parents to be involved in their child’s education by allowing access to course materials and assessments. Online grades, report cards, feedback and conferencing allow parents to stay up to date on their child’s progress. Regular attendance and participation in is essential to school success. Students who do not participate regularly in their online course regularly will risk experiencing a negative learning experience. Kanata Academy will maintain attendance records to ensure that students and teachers login to their course on a regular basis. Due to the continuous entry and exit model of our fully online courses, there is not yearly or semester calendar followed. Students who leave a course before completion must communicate their intentions either in writing to the Principal or over the phone before they will be officially withdrawn. Constant and relevant feedback and communication will be given to students to encourage regular attendance and participation. Students who have not completed their course within 18 months from the day of enrollment in that course, will be automatically unenrolled from the course. It is important to note that as of December 20, 2006, all students under 18 years of age, are required to be in attendance at school unless they have already graduated or are otherwise excused from attendance at school. The Brightspace Integrated Learning Platform at the Kanata Academy is intended for educational purposes only. Any use of any LMS tool within course for any other purpose other than the intended educational purpose is prohibited. The inappropriate uses include, but are not limited to, criminal, obscene, commercial, or illegal purposes. Student access into the LMS is provided as long as the student follows the guidelines set by the school Principal, provincial, and federal laws. If the LMS is used inappropriately or in a prohibited manner, the Principal reserves the right to terminate the registration or suspend the user. There is the possibility of further disciplinary action including legal prosecution, if the appropriate laws, regulations, or contracts deem it necessary. Malicious LMS network damage, interference or mischief will be reported to the appropriate authorities. It is important to be aware that activities in an online environment are not private. The school reserves the right to monitor all material that is placed in a user's account and to remove it if deemed necessary. Never reveal your password to your course to any individual except your parent. Always report to your Principal any email or chat message which causes you concern or any message which requests inappropriate personal information from you. Never attempt to access unauthorized material or to impersonate another user. Any attempt to vandalize, harm or destroy data of another user is prohibited. Any attempt to vandalize the data of the course or school is also prohibited. A positive learning and teaching environment is essential if students are to succeed in school. Kanata Academy is committed to creating school learning environments that are caring, safe, peaceful, nurturing, positive, respectful and that enable all students to reach their full potential. When a school has a positive climate, all members of the school community feel safe, included, accepted and actively promote positive behaviours and interactions with each other. Kanata Academy will conduct a School Climate Surveys to hear directly from students, school staff and parents about how they view our school climate. The results of the survey will allow us to make informed planning decisions about programs to help prevent bullying and promote safe and inclusive schools. Google Drive and Gmail are provided to all students for school functions but remain the property of Kanata Academy. Inappropriate electronic material is not permitted in the Google Drive or Gmail. The school reserves the right to inspect a student’s Google Drive or Gmail, when and where the welfare of the school is involved. All students are expected to treat other students, teachers and admin staff with respect, courtesy and consideration. Profanity will not be acceptable in any of the communication tools provided within the online courses. All students will accept the authority of the teachers and all teachers will demonstrate respect for all students. Threats, distasteful remarks, abuse of any kind, or harassment by any individual which impairs the health and welfare of any student or staff member is not permitted and is to be reported to the Kanata Academy Principal immediately. Plagiarism occurs when a student presents another person's work as the student's own. The Kanata Academy Plagiarism Policy is designed to teach the student to identify plagiarism, to distinguish between the two types of plagiarism, to identify strategies to avoid plagiarism, to practice proper paraphrasing and to explain the consequences of plagiarism by the student. Kanata Academy teachers have access to software which detects plagiarism. Commercial search engines are often very good at detecting work copied from material available online. Negligent Plagiarism means presenting someone's work as your own in an accidental, naïve, careless or reckless way. This often happens when a student paraphrases incorrectly or when a student borrows words or phrases from another source and forgets to cite the source. Dishonest Plagiarism means that the student has knowingly presenting a person's work as their own. All instances of plagiarism that are not considered to be negligent plagiarism will be assumed to be dishonest plagiarism. Kanata Academy provides on-line systems and resources for use by teachers and students. Online resources include all material that is accessed through a computer or telecommunications network. All policies, procedures, codes of behaviour and rules of the Kanata Academy apply to those using online systems and resources provided by or on behalf of Kanata Academy. The “Code of Online Conduct” pertains to the use of on-line systems and resources. This Code has been prepared to protect the rights and safety of all. Kanata Academy takes appropriate measures to ensure the security of the facilities and information that may be contained in them. Kanata Academy reserves the right to monitor the use of online resources by all that access the systems. Personal Safety Rules: Never reveal information about your personal identity (such as your name, address, phone number, age, physical description or school) to strangers whom you may encounter online. Likewise, do not reveal such information in a public online forum where you may not know everyone who might see the information. Never reveal personal information online about someone else unless you have their prior permission and you know the information will not be used for harmful purposes. Never reveal your access password or that of anyone else. Never send a picture of yourself, another person or a group over an electronic network without prior informed permission of all the individuals involved and, in the case of minors, their parents or guardians. Report immediately to a teacher any message or request that you receive that bothers you or that suggests personal contact with you. Never publish the specific dates, times and locations of your whereabouts to people who are not directly entitled to such information or to public forums where unknown persons might access the information. Unacceptable Sites and Materials: On a global network such as the Internet it is impossible to effectively control the content of the information. On occasion, users of online systems may encounter material that is controversial and which other users, parents or staff might consider inappropriate or offensive. It is the responsibility of the individual user not to intentionally access such material. If such material is accessed by accident, the incident must be reported immediately to a teacher or appropriate authority. Kanata Academy is committed to meeting obligations under the Canadian Charter of Rights and Freedoms and the Ontario Human Rights Code by providing safe schools and workplaces that respect the rights of every individual. Discrimination and harassment will not be tolerated. It is not acceptable to use online systems to knowingly access sites, which contain material of a discriminatory or harassing nature. Users of the Kanata Academy On-Line systems will not knowingly access, upload, download, store, display, distribute or publish any information that: is illegal or that advocates illegal acts or facilitates unlawful activity; threatens or intimidates any person or suggests violence, hatred or discrimination toward other people; uses inappropriate and/or abusive language or conduct; contains inappropriate religious or political messages; violates or infringes the rights of any other person according to Kanata Academy policies, Ministry of Education policies, the Ontario Human Rights Code, or the Canadian Charter of Rights and Freedoms; is racially, culturally or religiously offensive; encourages the use of controlled substances, participation in an illegal act or uses the system to incite criminal actions; is of a defamatory, abusive, obscene, profane, pornographic or sexually explicit nature; contains personal information , images, or signatures of individuals without their prior informed consent; constitutes messages of sexual harassment or which contains inappropriate romantic overtones; solicits any users on behalf of any business or commercial organization without appropriate authorization; supports bulk mail, junk mail or “spamming”; propagates chain letters, or other e-mail debris; attempts to hide, disguise or misrepresent the identity of the sender. It is the responsibility of students to be academically honest in all aspects of their schoolwork so that the marks they receive are a true reflection of their own achievement. Academic dishonesty, therefore, is a serious offence, and, as a result, it is imperative that students understand what academic dishonesty entails and are clear as to consequences. It is the responsibility of school staff to communicate to students that academic honesty is required in all aspects of their school work. Kanata is committed to ensuring the integrity of student achievement within its courses by promoting academic honesty among its students. Students are responsible for upholding integrity and will be held accountable for the quality of their work and actions. Kanata Academy takes preventative measures to reduce the incidence of academic dishonesty among its students. Academic dishonesty consists of any deliberate attempt to falsify, fabricate or otherwise tamper with data information, records, or any other material that is relevant to the student’s participation within any course. Using direct quotations or paraphrased material in any assignment without giving the proper acknowledgement. Relevant policies set out in Ontario Schools: Policy and Program Requirements, 2011 (OS) as set out by the Ministry of Education of Ontario are informative for parents and students. Links to all of the appropriate Ontario Curriculum Documents are made available to parents, guardians and students from the Introduction Unit of each course. They are also available to the general public from the Ministry of Education's website. Students choose between academic and applied courses in each of the core subjects - English, French as a second language, mathematics, science, geography, and history. Academic courses develop a student's knowledge base and skills through the study of theory and abstract problems. These courses focus on the essential concepts of a subject and explore related concepts as well. They incorporate practical applications as appropriate. Applied courses focus on the essential concepts of a subject, and develop a student's knowledge base and skills through practical applications and concrete examples. Familiar situations are used to illustrate ideas, and students are given more opportunities to experience hands-on applications of the concepts and theories they study. Open course are the only type of course offered in most subjects other than those listed above. They are designed to prepare students for further study in a subject, and to enrich their education generally. Open courses comprise a set of expectations that are appropriate for all students. Students in Grades 9 and 10, along with their parents or guardians will make the choice between academic, applied or open courses primarily on the basis of their strengths, interests, and needs. Kanata Academy guidance counseling team, and teachers are here to assist the student in making his or her choice of course selection. Students who are successful in any academic or applied course in Grade 9 will have the opportunity to enter either the academic or applied course in the same subject in Grade 10. Grade 10 courses do have prerequisite requirements. Grade 10 academic courses prepare students for Grade 11 University or College preparation courses; Grade 10 applied courses prepare students for Grade 11 College or Workplace preparation courses. Courses in Grades 10, 11, and 12 often require the student to have completed a prerequisite course. All prerequisite courses are identified in curriculum policy documents published by the Ministry of Education, and no course apart from these may be identified as prerequisites. Any school operating in Ontario must provide parents and students with clear and accurate information about prerequisites. If a parent or an adult student (a student who is eighteen years of age or older) requests that a prerequisite be waived, the Principal will determine whether or not the prerequisite should be waived. The Principal may also initiate consideration of whether a prerequisite should be waived. The Principal will make his or her decision in consultation with the student, the appropriate staff and the parent or guardian. Recognizing the needs of exceptional students and designing courses to meet those needs are important and challenging aspects of program planning. Students who have an existing Individual Education Plan will have that IEP honored through the implementation of appropriate accommodations. Elementary school students may reach ahead and take high school credits. This may occur only after the Principal of Kanata Academy consults with the student, the parents or guardian, and the Principal of the elementary school of the student. Kanata Academy will issue the OSSD credit. Students may register for any course at any time during the calendar year, progress through at their own rate and finish the course at any time up to 18 months from the time of registration. Students will access their courses online but in a more structured environment. They will follow a timetable set out by the Principal. At Kanata Academy, we have further broken down this 30% into RST and exam components. are communicated clearly to students and parents at the beginning of the course and at other appropriate points throughout the course. The achievement chart for each subject matter is included in the curriculum policy document, specific to that discipline. The chart provides a reference point for all assessment practice and a framework within which to assess and evaluate student achievement. 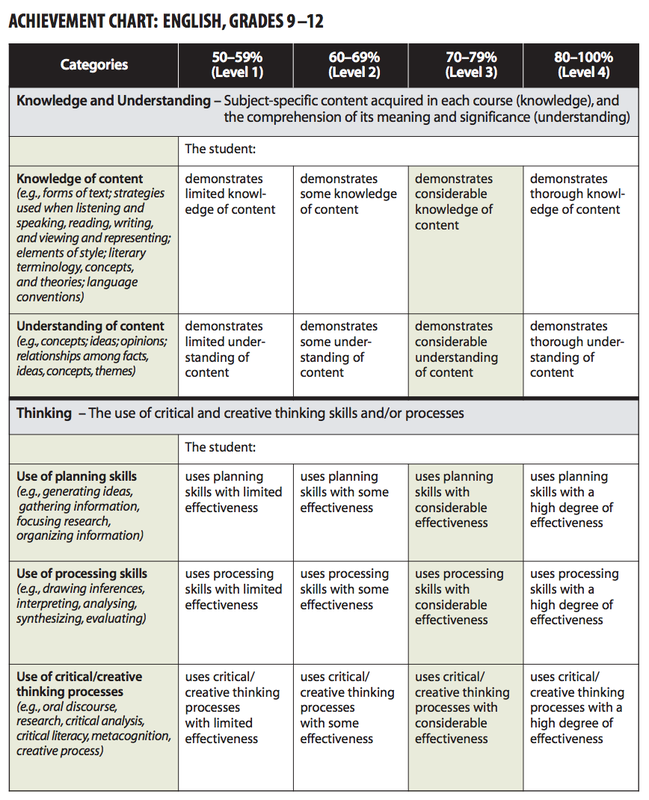 The chart is organized into four broad categories; Knowledge / Understanding, Thinking / Inquiry, Communication, and Application / Making Connections. 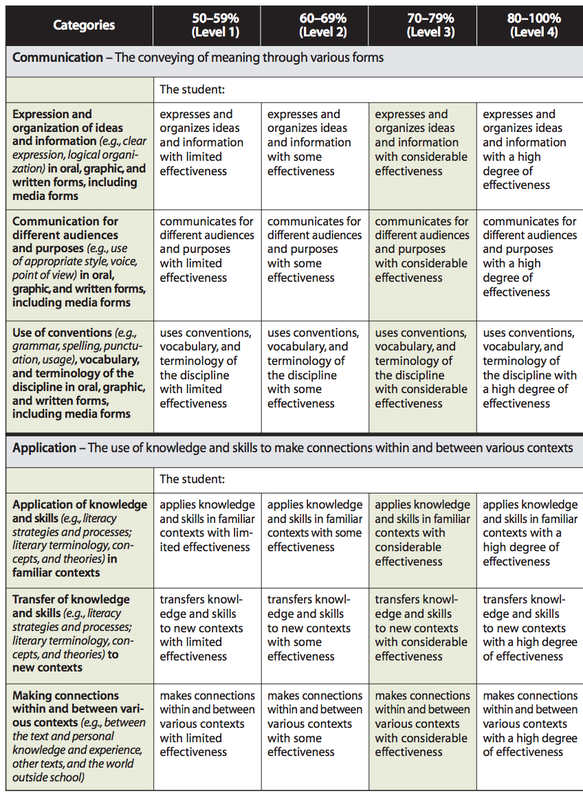 The names of the categories differ slightly from one discipline to another, reflecting differences in the disciplines. The achievement chart describes the levels of achievement of the curriculum expectations within each category. The descriptions associated with each level serve as a guide for gathering assessment information, to enable teachers to make consistent judgements about the quality of student work, and to provide clear feedback to students. The achievement chart provides teachers with a provincial standard to use in assessing and evaluating their students' achievement. A variety of materials are to be made available to assist teachers in improving their assessment methods and strategies and, hence, their assessment of student achievement. NOTE: Level 3 (70-79%) is the provincial standard. Teachers and parents can be confident that students who are achieving at level 3 are well prepared for work in the next grade or a subsequent course. A student whose achievement is below 50% at the end of the course will not obtain a credit for the course. Student achievement is communicated formally to students and parents by means of "Secondary School Report Card, Grades 9-12". The report card, which follows the Provincial Report Card very closely, provides a record of the student's achievement of the curriculum expectations in the form of a percentage grade. This reflects the corresponding level of achievement as described in the achievement chart for the discipline. A final grade is recorded for every course, and a credit is granted and recorded for every course in which the student's grade is 50% or higher. The final grade for each course in Grades 9-12 will be determined as follows: 70% of the grade will be based on evaluations conducted throughout the course. This portion of the grade should reflect the student's most consistent level of achievement throughout the course, although special consideration should be given to more recent evidence of achievement. 30% of the grade will be based on a final evaluation. This may be a final examination, a rich summative task, or a combination of both an exam and an RST. Evaluation refers to the process of judging the quality of student learning on the basis of established performance standards and to assign a value to represent that quality. Evaluation is based on "assessment of learning". While all curriculum expectations must be accounted for in instruction and assessment, the evaluation focuses on students' achievement of the overall expectations. A student's achievement of the overall expectation is evaluated on the basis of their achievement of related specific expectations. Teachers will use their professional judgement to determine which specific expectations should be used to evaluate achievement of the overall expectations. Evidence of student achievement for evaluation is collected over time from three difference sources; observations, conversations and student products. The report card provides a record of the learning skills demonstrated by the student in every course. The 6 identified learning skills and work habits are: (1) Responsibility, (2) Organization, (3) Independent Work, (4) Collaboration, (5) Initiative, (6) Self-regulation. The learning skills and work habits are evaluated using a four-point scale: (E - Excellent, G - Good, S - Satisfactory, N - Needs Improvement). The report card also includes teachers' comments on the student's strengths, weaknesses, and areas in which improvement is needed. Teachers will consider all evidence collected from all products submitted or not submitted. Some evidence may carry more weight than others. Teachers will consider all evidence and use their professional judgement to determine the student's report card grade. Determining a report card grade will involve teacher's professional judgement and interpretation of evidence and should reflect the student’s most consistent level of achievement, with special consideration given to the more recent evidence. The Principal will work with teachers to ensure common and equitable grading practices that follow Ministry policy. For Grades 7 to 12, a student's achievement of the overall curriculum expectations will be evaluated in accordance with the achievement chart and will be reported as percentage grades. It is expected that both mathematical calculations and professional judgement will inform the determination of the percentage mark. Each course has a final assessment that will be given as a final examination, a rich summative task, or a combination of both an exam and an RST. Students in the same course should be similarly evaluated, which means that final exams assessments will use the same format although particular questions may be different among the students. A course with a final examination must be written in a supervised environment with a proctor. A proctored exam is one that is overseen by an impartial individual, the Proctor, who monitors and supervises a student while he or she is taking the final exam. The Proctor enters the private password to allow student access to the final exam. The Proctor ensures the security and integrity of the exam process. Students in online courses with final exams, must fulfill their responsibilities in arranging and taking a proctored final exam. 1. Students must complete all of the assigned coursework. Coursework may include assignments, tests, projects, labs, discussions, etc. Students assume the responsibility to ensure that they have completed all of the assigned requirements of the course before completing the final exam or assessment task. Once the final exam is written or the final assessment is submitted, no further assignments may be submitted, unless prior arrangements have been made between the student and the teacher. The Ontario Student Record (OSR) is the official school record for a student registered in a school in Ontario. Every Ontario school keeps an OSR for each student enrolled at that school. The OSR contains achievement results, credits earned and diploma requirements completed, and other information important to the education of the student. These records are protected by the Education Act and Freedom of Information legislation in the Province of Ontario. If a student is enrolled in Kanata Academy as well as another Ontario secondary school, the OSR is held by the school where the student is taking the most courses. Kanata Academy will not hold the OSR for students who have already graduated at another school. If the student is currently attending another school - public or private - and is simply taking a single course from Kanata Academy, then that student's OSR will reside at the school that the student is attending and taking the most courses. Kanata Academy establishes or obtains the student OSR only if the student becomes the sole responsibility of Kanata Academy. Students and their parents or guardians (if the student is under age 18) may examine the contents of the OSR. Access to the OSR is also granted to the educational personnel from the Ministry of Education. The OSR is an ongoing record and may be transferred from Kanata Academy if the student transfers to another school. Transfer of all of the original material in the OSR occurs by Priority Post when Kanata Academy receives written request from the receiving school. If a student transfers outside Ontario, then only a copy of the OSR is transferred. The Ontario Student Transcript (OST) is an official document maintained by the Ontario school for each student. The OST is stored in the student's Ontario Student Record (OSR) and retained for 55 years after a student retires from school. It is a record of all secondary school coursework and diploma requirements. The OST will be issued to students whose OSR is held by Kanata Academy as required and upon graduation. In September 1999, the Ontario Ministry of Education instructed that schools in Ontario implement a policy of full disclosure. This policy states that all grade 11 and 12 courses attempted by students must be recorded on Ontario Student Transcripts. Students needing a certified copy of their Ontario Student Transcript from Kanata Academy may contact the Administration Head. If the student is currently attending another school - public or private - and is simply taking a single course from Kanata Academy, then that student's OSR will reside at the school that the student is attending. Where students registered in a publicly funded secondary school, earn a credit or credits with KA, the principal of the publicly funded secondary school is responsible for ensuring that the KA credit is recorded on the student's OST. KA will automatically forward an official copy of the student’s final report card of the course taken at KA to the student’s school holding the OSR, so that the credit can be added to the OST. KA establishes or obtains the student OSR containing the OST, only if the student becomes the sole responsibility of KA. Withdrawals occurring within 5 days of the issuing of the first report card from Kanata Academy will result in the mark not being recorded on the OST. A withdrawal from a Grade 11 or 12 course after 5 days of the issuing of the first report card results in a "W" being entered in the "Credit" column of the OST along with the mark at the time of the withdrawal. Withdrawals at any time from Grade 9 or 10 courses are not recorded on the OST. If there are extraordinary circumstances relating to a student's withdrawal from a course, an "S" may be entered in the "Note" column on the OST. In Grade 11 and 12, an "R" appears on the student's OST for the course with the lower mark. Kanata Academy is a Ministry of Education accredited private high school. You can accumulate credits towards an Ontario Secondary School Diploma (OSSD), just like students at any Ontario high school. When did you first start Grade 9? Students who are leaving secondary school upon reaching the age of eighteen without having met the requirements for the Ontario Secondary School Diploma or the Ontario Secondary School Certificate may be granted a Certificate of Accomplishment. The Certificate of Accomplishment may be a useful means of recognizing achievement for students who plan to take certain kinds of further training, or who plan to find employment directly after leaving school. The Certificate of Accomplishment is to be accompanied by the student's Ontario Student Transcript. For students who have an Individual Education Plan (IEP), a copy of the IEP may be included. Students who return to school to complete additional credit and non-credit courses (including courses with modified or alternative expectations in special education programs) will have their transcript updated accordingly, but will not be issued a new Certificate of Accomplishment. The Ontario Secondary School Diploma or Ontario Secondary School Certificate will be granted when the returning student has fulfilled the appropriate requirements. To graduate with an Ontario Secondary School Diploma (OSSD) you must earn credits, participate in community involvement activities, and complete the provincial secondary school literacy requirement. To find out what you require to earn your high school diploma, obtain a copy of your Ontario Student Transcript from your last high school and contact Kanata Academy. You can get any additional credits you need for your OSSD by taking new curriculum courses. How Do I apply for Maturity Credits? After you have completed one full Kanata Academy course, you may submit a request to the attention of the Guidance Counsellor for an official diploma assessment. You will need to submit your original secondary school transcript, a current resume and (if applicable) original documentation of courses and training completed outside of secondary school. If all documentation is in order, you will receive a one-page diploma assessment outlining your diploma requirements and the number of maturity credits you have been granted. Can I earn my diploma with maturity credits? No, a mature student must still complete a minimum of four Grade 11 or Grade 12 credits after becoming a mature student. These credits must include Grade 11 or 12 English. Kanata Academy's diploma assessment will tell you exactly how many more credits you need. Cooperative education is a hands-on method of learning that allows students to earn secondary school credits towards their OSSD by combining in-school studies with related work experiences. The student’s learning activities at the work placement are closely aligned to one or more related course(s) in which the student is enrolled or which he or she has successfully completed. The cooperative education course and the related course(s) together constitute a student’s cooperative education program. The cooperative education course includes pre-placement, integration and placement components. The Ontario Ministry of Education Policy document for Cooperative Education and Other Forms of Experiential Learning, provides an overview of required hours for each of these components. Students must remain at their placements until the date stipulated in their Work Education Agreement, even in cases where the required course hours have been completed before the end of the school term. The completion date of this agreement coincides with the completion date of other school courses. Cooperative education will be available to KA students from Grades 11-12. It is possible for a Grade 10 student to be placed in the Cooperative education program, but it will be determined by the principal on a case-by-case basis. Some students at Kanata Academy may require support in learning the English language and to develop a full range of English literacy skills to enable them to achieve the curriculum expectations in all subjects and at all grade levels. The programs of study offered by Kanata Academy will be flexible in order to accommodate the needs of students who require instruction in English as a second language or English literacy development, and teachers of all subjects are responsible for helping students develop their ability to use English. Students who enroll in Kanata Academy are required to provide information during registration about their English language learning backgrounds, including the number of years they have been learning English. This information is provided to teachers so they can target instruction and provide appropriate accommodations throughout the course. Appropriate accommodations to teaching, learning, and evaluation strategies help students gain proficiency in English, since students learning English as a second language at the secondary level have limited time in which to develop this proficiency. English Language Learners (ELL) are encouraged to explore opportunities to work in their first language, to use a bilingual dictionary, to keep a vocabulary log, and to use graphic organizers to help them complete complex tasks. ELL are provided with extra time on quizzes, tests, and examinations to ensure they have time to process the demands of the task as well as to process the language. Special consideration is given to more recent evidence of achievement. Kanata Academy will provide individual student counseling with respect to course selection and post-secondary planning. By doing so, individual student needs and concerns are met and appropriate plans can be put into place. In addition, the skills and competencies that students acquire through the guidance and career education program outlined in Ontario's “Creating Pathways to Success: An Education and Career/Life Planning Program for Ontario Schools, 2013” will not only help students succeed in school, but will also contribute to their success in the workplace. communicates directly with post-secondary institutions regarding student achievement. At Kanata Academy courses are entirely online and students experience firsthand the benefits of a technologically enriched education and thereby acquire skills for the 21st century. Increasing reliance on computers, networks, and information technologies in society makes it essential for students to become computer literate and to develop information literacy skills. Information literacy is the ability to access, find, select, gather, critically evaluate, create, and communicate information. Kanata Academy places a great deal of emphasis on using the information obtained to solve problems and make decisions. Students will become familiar with a wide range of available software programs. Among the applications that can aid student learning are multimedia resources, databases, video lessons, simulations, Google Hangouts, collaborative online learning through Google Docs, learning modules, and simulations. Students will also be expected to use software applications that help them develop general skills in such areas as writing, problem solving, research, and communication. It is important that students learn to critically evaluate the accuracy, validity, currency, comprehensiveness, and depth of the information they access using information technology, particularly the Internet. In general, students must acquire the knowledge, skills, and attitudes to allow them to use computer and information technology safely, effectively, confidently, and ethically. All students must complete a minimum of 40 hours of unpaid community involvement activities before graduating from high school. This requirement is additional to the 30 credits needed for a high school diploma. Students who are the sole responsibility of Kanata Academy will be able to choose their own community involvement activities, within guidelines that will be provided by Kanata Academy. Students will be responsible for fulfilling this requirement on their own time, and for keeping a record of their activities on a tracking form supplied by the school. The student is required to submit the tracking form yearly and the data will be placed on the OST to be kept in the student's OSR. Students will provide documentation of completion of volunteer hours to the Principal of the school where the student's OSR is held. Students are to select community activities appropriate to their age, maturity and ability. The student is not to partake in any activity in which the student's safety will be compromised. Any activity NOT on the approved list must receive written approval of the Principal of Kanata Academy before beginning the activity. Any involving activities for a court-ordered program (i.e. community-service program for young offenders, probationary program). Church activities such as helping teach Sunday school, bazaars, etc. Involvement in community committees, food banks, fairs, etc. Participation in environmental projects such as a recycling projects, etc. The Principal is required to provide information about the community involvement requirement to parents, students, and community sponsors. The Principal is also required to provide students with the information and forms they will need to complete the community involvement requirement, including the school's list of approved activities from which to choose. After a student completes the 40 hours of community involvement and submits all documentation of their completion to the school, the principal will decide whether the student has met the community involvement requirement and, if so, will record it as completed on the student's official transcript. Students will select an activity or activities from the list of approved activities, or choose an activity that is not on the list, provided that it is not an activity specified on the Ministry of Education's and the school's lists of ineligible activities. If the activity is not on the list of approved activities, the student must obtain written approval from the principal before beginning the activity. Before beginning any activity, students will provide the principal or other school contact with a completed "Notification of Planned Community Involvement Activities" form indicating the activity or activities that they plan to do. This form must be signed by the student, and by his or her parent if the student is under eighteen years of age. More than one such form may be submitted when additional activities are planned that were not included on a previously submitted form. A "Completion of Community Involvement Activities" form must be completed by the student, the student's parent (if the student is under eighteen years of age), and the community sponsor (that is, the person or organization that provided the community involvement opportunity for the student). The student must submit the form to the principal or other school contact upon completion of the 40 hours or at appropriate intervals determined by the principal. Parents (or guardians) should provide assistance to their child in the selection of their community involvement activities. Parents are also encouraged to communicate with the community sponsor and the school principal if they have any questions or concerns. A parent must sign the "Notification of Planned Community Involvement Activities" form and the "Completion of Community Involvement Activities" form if the student is under the age of eighteen years. Parents are also responsible for obtaining the appropriate insurance covering the student for any unseen circumstances while involved in these community activities.